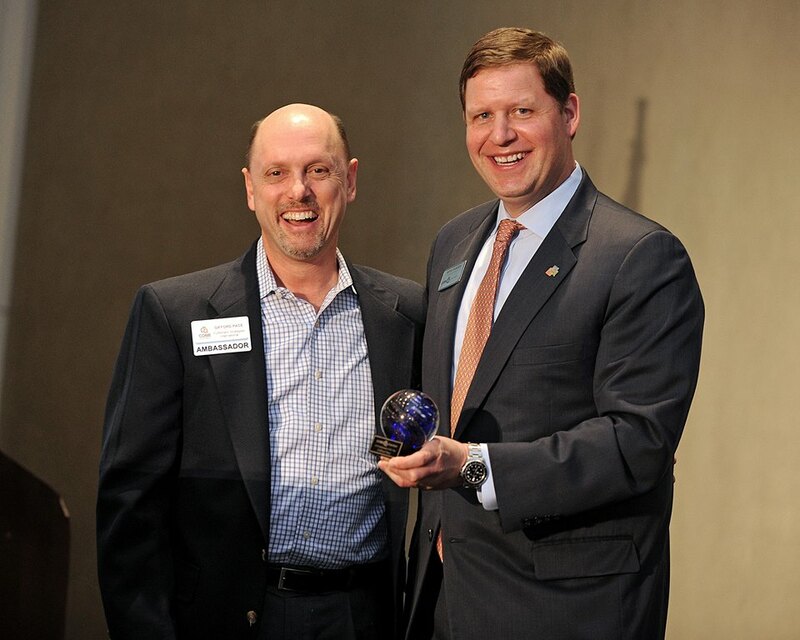 March 2019 – Cobb County – The Cobb Chamber of Commerce announced today that FSI’s very own Gifford Pace, Business Development Consultant, won the 2018 Ambassador of the Year Award. Announced at March’s 1st Monday Breakfast, where between 400- 500 people heard from some of the most recent companies that have announced their plans for relocation or expansion in Cobb. The panel discussion was led by Kevin Greiner, CEO of Gas South and Chairman of SelectCobb. Panelists included Pete Desai, Chief Operating Officer at BioIQ; Devesh Mathur, Ph.D., Global Technology Director at Novelis Global Research & Technology Center; Cynthia Reichard, Executive Vice President at Arylessence, Inc.; and Dene Sheheane, Vice President for Government & Community Relations and Interim VP of Institute Communications at Georgia Institute of Technology. These companies have made new investments and brought quality jobs to our community. This panel will share why they and other global brands chose to grow and stay in Cobb. When Gifford was asked if he knew he was getting an award, he said “It was a complete surprise. I was told that another person was getting an award. I wanted to make sure I stayed for her. Big surprise and honored.” He went on to add, that the Chamber Ambassador program is not only run by some great people, but also that the other Ambassadors are professional, personal and fun. In June 2018, FSI was awarded as one of the Top 25 Small Businesses in Cobb County for the 10th Year. Their business continues to focus on helping consumer product companies, from entrepreneurs to Fortune 500 companies, get their client’s products to the individual consumers, retail locations, or team members by specializing in the inventory management, order fulfillment, and kitting of e-Commerce. They can be reached at 678-391-5980 or email sales@fsifulfillment.com.